Are you wondering what to give all the wordsmiths on your shopping list this holiday season? How about decent pay, a steady flow of work (without having to do too much promotion), and a good computer that doesn’t keep crashing in Microsoft Word? All joking aside, it’s easy to find many more-or-less affordable gifts for editors and writers. Here are some gift suggestions that will delight even the most difficult to please. Popular discussion items on an editors’ social media page include the many English words for various styles of garments that cover one’s bottom. Everyone is envious of Arlene Prunkl’s editing pants, which she says are “a rare find: denim, loose-fitting, jean-style” pants, with pockets and a drawstring waist. In the past, Arlene has sewn her own, but this year she’s trying an online retailer. Once sitting down in comfortable trousers, if not using a computer, writing implements are a must. 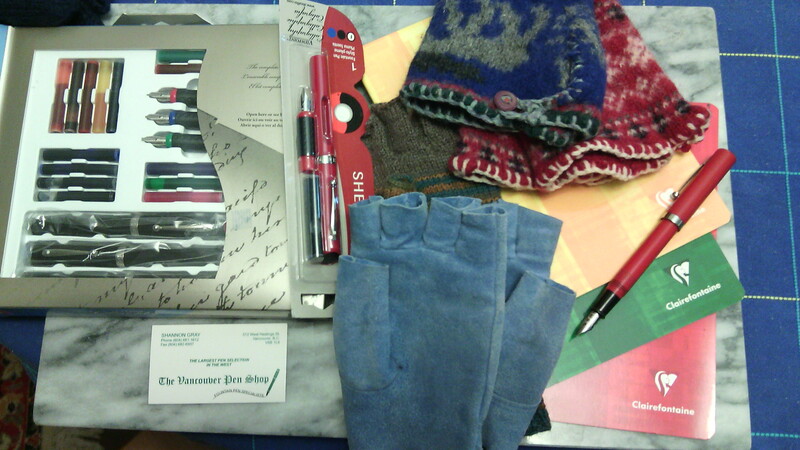 My favourite store on the “wet coast” is the Vancouver Pen Shop on Hastings Street, where I replenish ink for my trusty old Sheaffer fountain pen (first one bought in 1967 for 98 cents). Fountain pen aficionados can go wild over a range of products, from Sheaffer calligraphy cartridge pen sets to pricey sorts with osmiridium nibs, to the old-fashioned quill pen and inkwell. You can try out the latest Ferrari, or rather Pininfarina, of writing instruments—a metal alloy stylus that writes on paper in a mysterious process of oxidation, producing a mark reminiscent of a silverpoint drawing tip, at a fairly precious price as well (about $100). It’s called the Napkin® FOREVER because it’s supposed to last “forever,” but I doubt it writes as fast as a good fountain pen. The FOREVER stylus is designed to be accompanied by stone paper, a substrate of about 80 percent calcium carbonate and 20 percent polymers. You won’t catch me using it any time soon though, in spite of my love of rocks, as I avoid plastic products in favour of more eco-friendly alternatives. Also, the plastic content repels fountain pen ink, making it slow to dry and therefore likely to smudge. Most good plant fibre paper is already smoothed with fuller’s earth or calcium carbonate, as are Clairefontaine notebooks. As a field geologist, I have tried two different types of waterproof paper, and prefer Rite in the Rain, a brand of paper that burns rather than melts. If you’re editing on paper, you might like a cheerful set of Montblanc highlighters, only about $500 for the pen unit and an additional amount for each coloured felt-tip highlighter insert. You can keep them in a bright Laurige leather case, also available from the Vancouver Pen Shop. As always, I recommend fingerless gloves for anyone sitting at a computer in a cold room or at an outdoor bistro table at a coffee shop all day. Either knit your own, repurpose an old sweater sleeve, cut off a pair of gloves, or buy ready-made mitts. For those whose computers crash from overheating, on the other hand, try a cold marble slab cutting board (that useful calcium carbonate again!) to place under the hot machine for heat absorption. 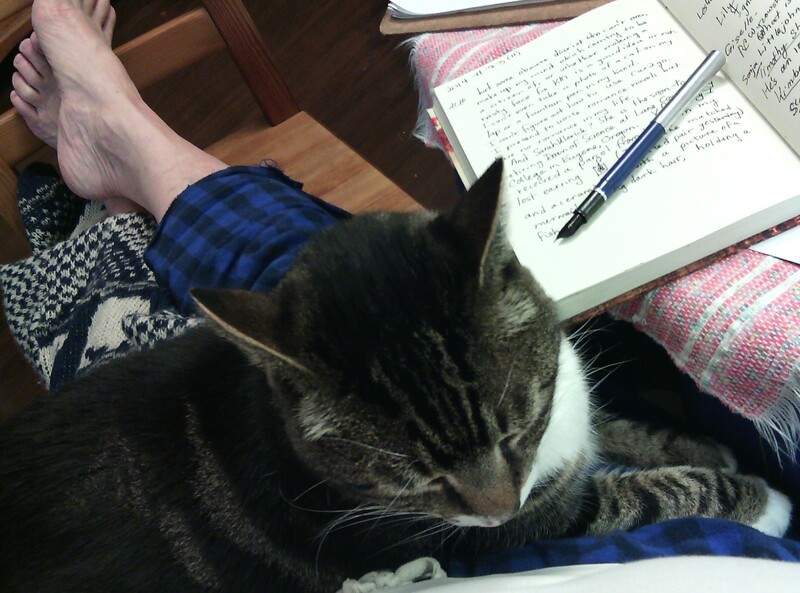 Finally, what any editor with a cat needs is a lap blanket (you can also repurpose last year’s ugly holiday sweater) to keep the cat’s claws from ruining the new editing pants. Jennifer Getsinger has been a contributing editor, frequent copy editor, and frequent proofreader at West Coast Editor since 2007. Gift boxes image by Shutterstock; gift ideas photos by Jennifer Getsinger.